“If you finish eighth you’ve got no stresses. 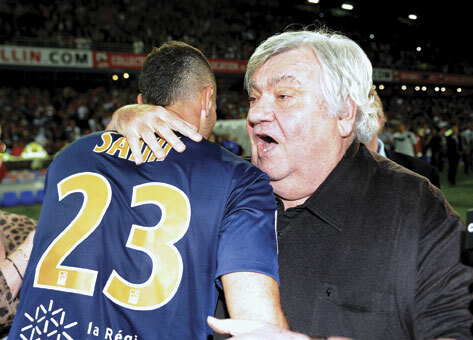 But this has been horrible!” As a man who had been dreaming of ultimate glory with Montpellier since taking over the club back in 1974, this was a bizarre way for president Louis Nicollin to express his joy at his side’s first French league title. But then again, the 69-year-old is and always has been a bizarre, outspoken character. A couple of random examples. Nicollin called France midfielder Benoit Pedretti “a little gay boy” live on TV back in 2009. He said he’d like to kick Gerard Houllier “and all those other tossers at the national technical centre” in the backside over their treatment of his coach Rene Girard when he worked for the French federation. And he got himself a mohican and dyed it in the club’s colours of blue and orange to celebrate their triumph. Discreet he is not, but Nicollin is what the French like to call “entier”. He’s wholehearted, full on and unburdened by concerns about convention. And there can be no doubt that Nicollin’s passion for Montpellier, his limitless energy and, of course, his reasonably substantial amounts of cash have been crucial factors in one of the unlikeliest success stories in European football. While all the media attention was on Paris Saint-Germain, their Qatari gazillions and their star-studded team during the 2011-12 season, Nicollin kept on believing that his unfancied team would defy the odds. And so it came to pass on Sunday, May 20, 2012. Montpellier came from a goal behind at Auxerre to win 2-1 and finish the 38-match campaign three points ahead of PSG. Nicollin compared it to him personally climbing the Himalayas – and given the vast size of the man that was some image to conjure with. But in truth Montpellier’s victory seemed even more improbable than that. They were David to PSG’s Goliath – and then some. In the club’s moment of triumph even those who find “Loulou” Nicollin’s forthright personality downright boorish seemed to be happy for him. Why? Because nobody could accuse Nicollin of being a “Johnny come lately” glory hunter. While working in the family waste-disposal business in the Drome region of France back in 1974, he indulged his passion for football by taking the reins at a nondescript amateur outfit, the Montpellier Paillade Sport Club. He turned them into a Ligue 1 club in just eight years, by which time he had inherited the family business. It was a phenomenal achievement, and while there have been plenty of ups and downs in the 38 years he has been running the Montpellier Herault Sport Club (the name changed in 1989), Nicollin is still at the helm, still as passionate as ever. Nicollin represents an alternative French attitude – more representative of the nation as a whole, perhaps – in the face of those suave, sophisticated and sniffy Parisians. Nicollin is France’s everyman, a bon viveur with a foul mouth and a total disregard for other people’s opinions. Which is why Montpellier’s triumph – and Nicollin’s in particular – was hailed by everyone outside the capital. Montpellier’s contribution to French football runs deeper than this solitary championship. While the club has managed only one French Cup victory, in 1990, in its present guise and an InterToto Cup success in 1999, Nicollin has nevertheless been instrumental in hiring some of the most colourful players ever to grace the French game. Carlos Valderrama, Roger Milla and Eric Cantona have all played for Montpellier. And let’s not forget Laurent Blanc, arguably France’s greatest defender, was a product of the Montpellier academy and went on to make 294 appearances for the club between 1983 and 1991, before moving to Italy. The league trophy was just reward for years of entertaining the public. But if anyone thought that success might mellow the man, Nicollin was quick to prove them wrong. Barely had the title celebrations ended than he was back to his old tricks, venting his spleen, this time in the direction of his own players. Montpellier are going through a diabolical case of “second-season syndrome”, languishing in the lower reaches of the table a million miles away from the heights scaled last term. But Nicollin has seen it all before, and will no doubt deal with it in the same idiosyncratic manner. And you know what? French football would be a lot quieter and less interesting place without him.